HIGH STRENGTH – Contains 500mg of SuperbaTM pure Antarctic krill oil for supporting normal cholesterol levels for heart health, joint flexibility, joint health, brain functioning. OMEGA-3 FATTY ACIDS EPA and DHA are well known for their benefits on heart & brain health, with Krill oil has also proven to be effective on joint and women’s health. 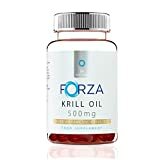 Why Choose FORZA Krill Oil? Krill oil is a rich source of the omega-3 fatty acids known as EPA and DHA, which are vital for the normal function of the brain and heart as well as helping to support normal vision and eye care. The EPA and DHA present in krill oil comes in the form of phospholipids, which can be absorbed far easier by the body – making krill oil the most superior source of omega-3 fatty acids. Each softgel capsule contains 215mg of phospholipids and also 50µg of naturally-occurring astaxanthin. SuperbaTM krill oil is sourced from the cold and unpolluted waters of the Antarctic, meaning that the krill oil is pure and contaminant-free. It is sourced by Aker BioMarine, the only MSC-certified sustainable krill fishery in the world. The softgels are also vanilla flavoured to prevent any unpleasant fishy odour or aftertaste. OMEGA 3 ADVANCED – 60 Premium Supplements with huge 1250mg serving of Omega 3 Fish Oil – containing Triple Strength super-high dosage of 960mg EPA and 720mg DHA per serving for Improved Immune System, Heart, Brain and Cardiovascular Functions. 100% GUARANTEE!